Who doesn't like meat on a stick? It's meat...with a handle! I watch that Bizarre Foods show and from that show alone have determined that there must be something psychological about skewering meat that will make people eat just about anything. "Scorpions? Uh, I don't know…oh, they are on a stick? Heck yeah!" 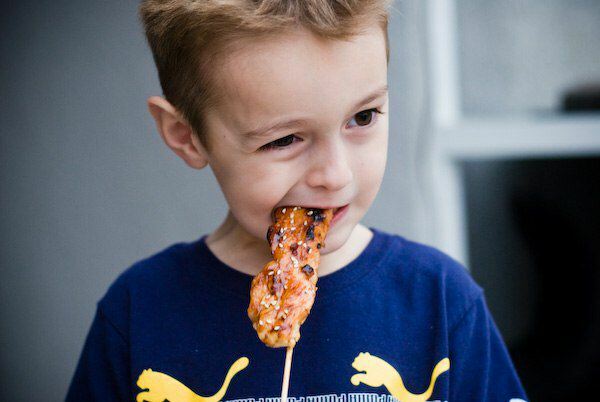 To further prove my theory that no one can resist a skewered piece of meat, I present my oldest son (5 years old). Most dinners around my house begin with a negotiation "how many bites do I need to take to get a Fudge Pop (which is ice cream, on a stick, by the way)?". My son eats for dessert, unless dinner involves a stick as well. Case in point is this next recipe, which has become a favorite around the house for all ages. 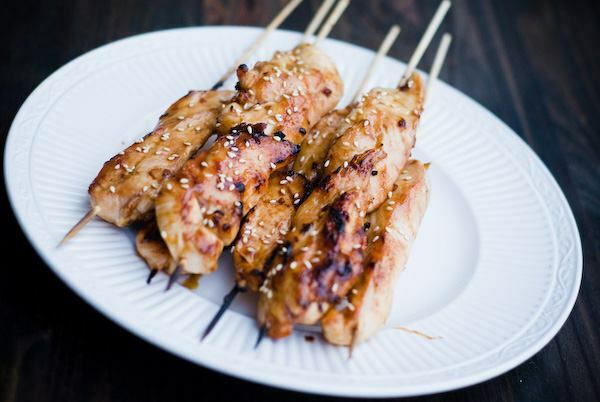 Skewer up some chicken breast slices, make a quick glaze and hope there are enough left over to make a few chicken wraps. Mr. "How Many Bites?" usually snags as many as he can before we can even chop up the garnish for the wraps. zone to cook the chicken most of the way through and then a medium, indirect heat zone to finish them off while we glaze. If using a gas grill, light two of the burners on high and the remaining burners on low. If using a charcoal (like me this time), pile all of the coals up to one side. 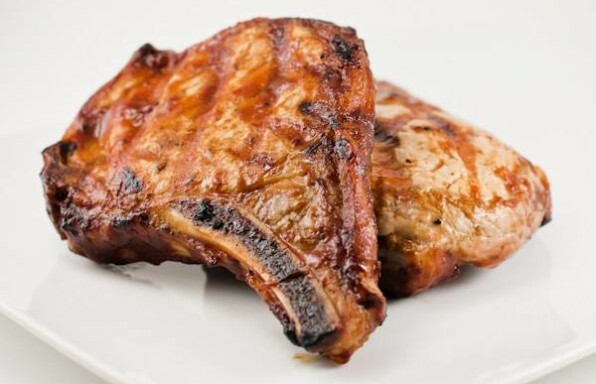 2While the grill is heating up, heat a pan with a tablespoon of oil to medium heat. 3Add the garlic and ginger and cook to soften, around 4 minutes, stirring occasionally so we don't burn. We just want to soften, not brown or burn, so watch carefully. 4Stir in the soy sauce and allow to simmer gently for about 2 minutes and then add the honey. Gently simmer the honey for another 2 minutes to melt, stirring frequently. 5Remove the glaze from the heat and set aside. 6Slice the chicken breast into long slices about 1 inch wide. 7Skewer the chicken slices onto the soaked skewers. 8Place the chicken skewers over the high heat and cook for about 5 minutes on the first side with the lid open/off. 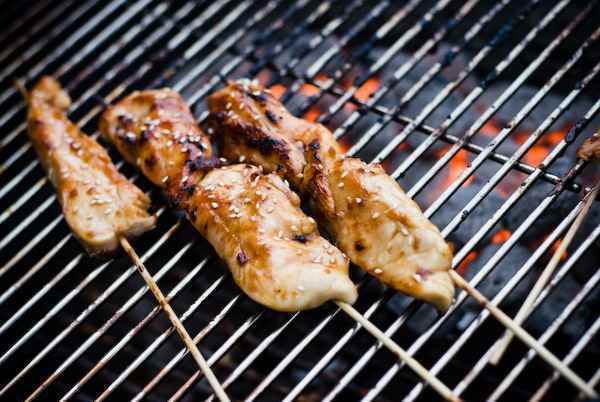 9After about 5 minutes, turn the chicken skewers over and move to the cooler side of the grill. 10Continuously brush the chicken with the glaze for another 5 minutes, or until the chicken is done. Keep an eye on the chicken, all of that honey will burn over higher heat, so reduce heat or move the chicken away from the heat as necessary. Make sure you liberally brush on the glaze and keep the lid closed when possible, closing the lid will aid in the glazing process. 1Once the chicken is done, sprinkle on the toasted sesame seeds and move to a platter. We like to assemble wraps with the chicken, fresh cilantro, green onions, shedded lettuce and a drizzle of the left-over glaze (a little goes a long way, it's sweet!). If you are worried about contamination, bring the glaze to a simmer to kill anything off. As long as you brushed the cooked side (as instructed), you should be fine. Watch that platter though, the meat on a stick tends to disappear quickly! I have made this many times and always love it! Any leftovers get cut up and placed on a salad – so good that I have made them just to top a salad.! Meat on a stick! Kids love eating off a stick for some reason. Meat-pops.